We touched upon the basics of white label banking in the article "Doing More With Less" and saw how it delivers powerful tools to service providers to notch up the engagement level with their customers. The concept of white label banking closely synergises with Banking-as-a-Service – a concept explained in exquisite detail here. Whereas white label banking allows new entrants providing financial services to quickly ramp up their service suite by “borrowing” products from a white label provider; BaaS allows for rapid, on-demand and comprehensive deployment of such products. Taken together, they provide the potential to revolutionize financial products and their distribution. How would such a system really work though? The following image illustrates the various parties which cooperate to provide customized banking products which are then offered as an on-demand service. Licensed Bank – At the base, we have a full service licensed and regulated bank. The bank provides financial products to intermediaries and has the eventual responsibility for maintaining regulatory compliance. 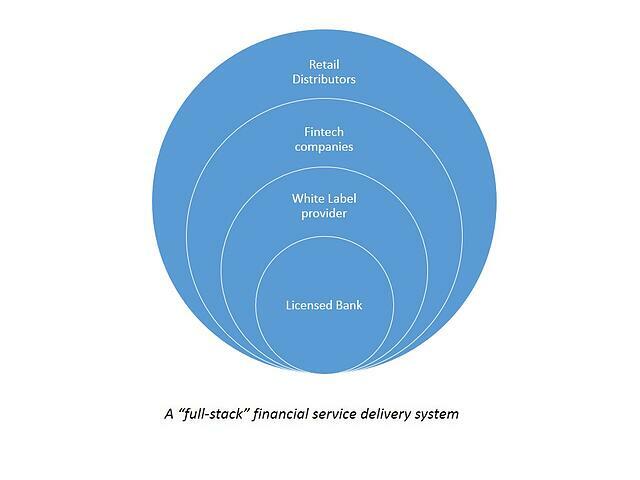 White Label Provider – This could be the same bank or some other entity which uses a licensed bank’s core facilities to create new and innovative products that it then sells to front-end service providers. All services are listed (including from multiple core banks) and customers can customize and select products based on their needs – this is essentially Banking as a Platform. Fintech service providers – These companies provide the interface and the actual product delivery implementation. The opportunity also exists for fintech service providers to offer a communication interface between all of the entities and the customer. Their USP would be in building a unique and rewarding platform for customers to bank on with advanced analytical and authentication tools. Distributors – These would be businesses which specialize in mass distribution. For example telcos which offer cell phone services to millions, or supermarket chains with a strong local presence which can tap into their existing customer base and distribute financial products. It is important to realize that this structure or classification is not sacrosanct. Some companies have already been doubling up and playing more than one of these roles already. However, the strength of the concept lies in exploiting the core competency of each player and providing a cuztomized solution to the end customer – a product that has everything that the customer wants. Let’s look at an example to see how this might pan out in the real world. At the base, we have a full-fledged licensed bank. On top of this, there is white label service provider – let’s say a credit card company. The third level is the distributor – your local supermarket or mobile service provider. Finally, all of these systems communicate via encrypted and secure channels built by a fintech company which also provides the mobile/web portal to transact and view details about your card usage etc. This might seem similar to a traditional platform but the advantage of the system is that each of the components of the value delivery chain can be swapped. For example, you can choose the bank with the lowest rate, a white label provider which provides a product most suitable to your needs, an end user platform that automatically categories your spending and then just buy this through your telecom provider. It’s like buying a car where you can choose the engine manufacturer, the body maker, the interior designer, the customer service provider and build your own unique automobile.